Aladdin was one of my faaavorite movies growing up. I’ve watched it countless times and know all of the songs. Very much like Genie made me feel as a child – my son warms my heart and makes me laugh with his high energy and silly crazy ways. So in honor of the late great Robin Williams, and one of my favorite characters he played, it only felt right to have my son be Genie for his first Halloween. I searched high and low to buy a costume but had no luck. 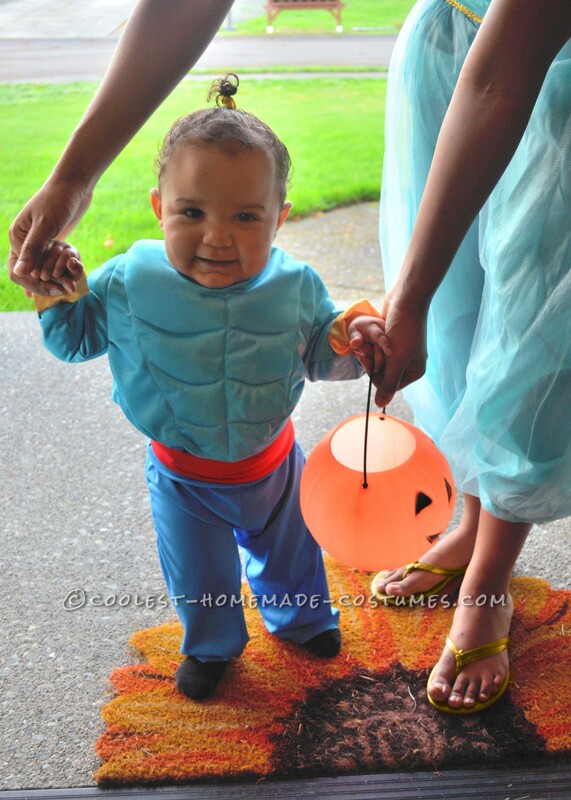 Online searches showed adult and big kid Genie costumes, but there was nothing for babies. Not even any photos to work off of! I figured it shouldn’t be too hard to make it myself, but boy was I wrong! There were many times I thought I had bitten off more than I could chew. When looking for fabric it was very difficult to find the right shade of “Genie” blue. But I struck gold when I went to my local Goodwill! I found fabric for every part of his costume there, and the best part was it being super cheap! His cuffs are fabric from a girl’s Belle dress that was 99 cents, Genie’s body is from a woman’s $4.99 geisha dress, the pants are from part of a boy’s spiderman costume for 99 cents, and the red waistband is made from a girl’s devil dress that was also 99 cents. I consider myself an amateur seamstress so never having sewn sleeves before and working with limited fabric proved to be a difficult task. But it was well worth it and I saved so much money!